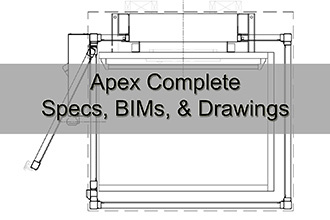 Apex Complete: This wheelchair lift comes with an integrated enclosure. The enclosure panels can be painted aluminum, clear polycarbonate, tinted polycarbonate, or tempered glass. This is commonly used in outdoor applications or indoors traveling up to a mezzanine. The upper landing can have a 42” high half-door, or a full height door and dome enclosure.